She came, she did not see and she fell. Into a grave. She was not buried alive, thank God, but she broke several bones and now she's suing. That legal battle is ongoing at the Civil Division of the High Court in Roseau between Safiya Shillingford and the Roseau City Council in suit DOMHCV NO.350 of 2011. In that suit, Shillingford, who fell in a 6-foot uncovered grave during the traditional ceremony of the lighting of the graves said she suffered and continues to "suffer pain, injury, loss and damage." Among her injuries were bone fractures in her hip and leg. According to the Statement of Claim: "On November 1, 2008 at approximately 7 pm Shillingford was in the Roseau Roman Catholic Cemetery participating in the lighting of the graves, which is an annual Roman Catholic event, when she fell into an open grave which was more than 6 feet deep." It further states: "The Claimant believes that the accident was caused as a result of the negligence of the Roseau City Council (RCC) its servants and or agents who failed to cover the open grave to prevent or avoid visitors to the cemetery falling into it and also taking into account the event that would be taking place at the Cemetery on November 1, 2008 failed to place and or maintain appropriate and sufficient warning at or close to the open grave to alert visitors of its presence…" However, the RCC through its lawyer, Steven Isidore, has denied Shillingford's claim saying she was "negligent" and among other things "failed to take adequate precaution for her own safety." "The Claimant failed to take any or sufficient steps to avoid the alleged fall, being fully aware of the risk of walking in a graveyard at night. She also failed to look where she was walking; walking/proceeding too fast in all the circumstances and in the premises failing to take any or any sufficient care for her own safety." In the circumstances, the Claimant is not entitled to any of the reliefs claimed against the defendant, the defense stated. Shillingford, through her lawyers, the law firm of Heather F. Felix Evans, claims that the RCC is the authority responsible for the digging of graves in Roseau and often graves would be dug a day in advance of burial. But witness statements obtained from City Overseer, Edison Alleyne, and City Clerk, Angus Benjamin say "the council was not negligent as it did not instruct independent grave diggers to dig the grave at the Roman Catholic Cemetery on November 1, 2008. "On November 1st, 2008 when the accident is alleged to have occurred, the Council had not received any request from anyone immediately prior to or on the said day for digging of a grave to accommodate a burial. Further, it is not the practice of the Council to instruct diggers to dig graves overnight in preparation for a burial the following day," Benjamin stated. 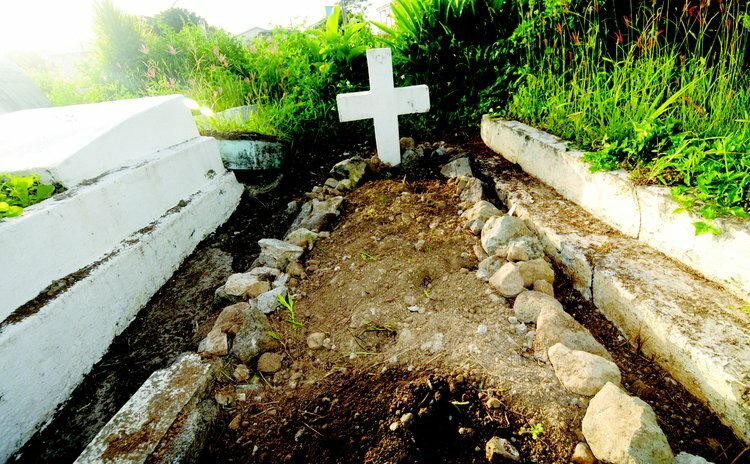 But Shillingford denies that any so-called "independent grave diggers" exercise responsibility or exclusive control over the digging of graves in the Roseau Roman Catholic Cemetery. Also, that every family requesting burial for a deceased person in the Roseau Roman Catholic Cemetery is "specifically referred to the RCC and a specific written notice of request for burial is forwarded from the Church office to the RCC." A visit last week by reporters of the SUN did not find any open graves but in an interview Julian Walsh, an elderly man who frequents the cemetery, said: "I am not sure how long since they stop the practice of overnight digging but it's months since this has stopped because a child fell and in grave and his/her legs got damaged. The Council has stopped people digging graves a day before as a result of that incident. Before that incident, three or four graves would be dug before hand for preparations. The City Council is the one you must go to so as to get permission to dig a grave and they are paid $600 for that service with a small fee going to the church." Justice Errol Thomas is presiding over the matter.